I discovered this fascinating novel – actually a saga that goes through over four decades – by randomly attending a book event in Manhattan . Hearing the author reading from it, I was intrigued to read more about it – a story about living in Israel from a Palestinian point of view, starting from the creating of the state of Israel in 1948 to the signing of the peace accord that (at least in theory) ended hostilities between Arabs and Jews in that disturbed region. Miral opens with the 1994 death of Hind Al-Husseini, a real-life character who dedicated her life to the care of Arab orphans in Israel after rescuing 55 survivors of the 1948 Deir Yassin massacre. The story then takes us back to Al-Husseini’s early life as a privileged girl and her dedication to social work, which led to the founding of Dar al-Tifl al-Arabi (House for Arab Children), which also doubled as a boarding school where Miral – the novel’s central character – is taken to after her mother’s took away her own life. The narrative then unfolds mostly from Miral’s point of view. As she grows, she becomes more politicized and joins the struggle against what she sees as the occupation of her native land by the Israelis. As a teenager, she joins demonstrations against the occupation that begin peacefully then become increasingly violent – at one point, Miral finds herself throwing Molotov cocktails at Israeli tanks during confrontations with the military. Al-Husseini tries in vain to keep Miral away from politics (she does the same with all her students – which is an act of self-protection to keep the orphanage and school open), and becomes more and more concerned with the situation of the country and also with Miral’s despondency. However, when tragedy inevitably hits, the young girl is forced to reevaluate her views, and also grow up in the process. 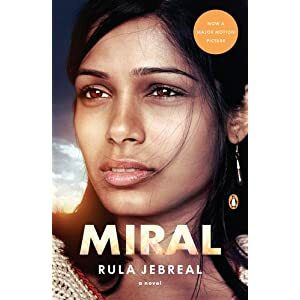 Author Rula Jebreal does not hide the autobiographical aspects of this novel. Like Miral, she attended Dar al-Tifl herself after her own mother’s suicide. But she does not depict either side of the conflict – Arab or Jew as the villain here. Readers who have a strong pro-Israeli point of view might see this book as biased (reviews of Julian Schlabel’s movie adaptation – which prompted the book’s publication in the US – have repeatedly said so) and unilateral, but the fact is that Jebreal tells the story the way she saw it as a teenager – not from a more enlightened perspective of an adult. It is a great read, and it is recommended regardless of one’s politics on the issue.